Head of Shuva Israel sect flew from NYC to Israel to be arraigned in court, and was taken directly to hospital. Rabbi Yoshiyahu Pinto was taken to the Ichilov Medical Center Monday morning after apparently suffering a heart attack on the plane that brought him to Israel from New York. Rabbi Pinto, who heads the Shuva Israel sect, flew to Israel in accordance with a District Court order, in order to be present at his arraignment Tuesday in a high profile bribery case. The rabbi's assistants said that he suffered a heart attack a short time before landing in Ben Gurion Airport and that he was taken directly to the hospital, where he is expected to undergo catheterization in the next few hours. The assistants said that the rabbi decided to fly to Israel despite advice to the contrary from his doctors in the US, after undergoing three operations in the last few weeks. The rabbi's relatives asked his followers not to visit him in the hospital but rather pray and say Psalms for his recovery. Rabbi Pinto signed a plea bargain agreement last year that attributes to him crimes of bribery, attempted bribery and disruption of proceedings. The State Attorney's Office is expected to demand a one year prison sentence against the controversial rabbi. 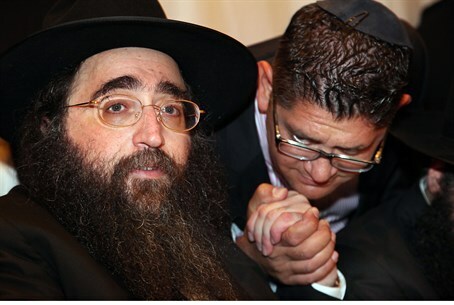 As part of the plea agreement, Rabbi Pinto would serve as a state witness against former police officer Maj. Gen. Menashe Arbiv, who is to be investigated on suspicion of receiving benefits. Earlier last year, the Attorney General's Office stated it would file an indictment against Rabbi Pinto for allegedly attempting to bribe senior police officer Ephraim Bracha with $200,000 for information about a pending police investigation into the Hazon Yeshaya charity organization, which Pinto headed. Bracha immediately reported the incident to his superiors, prompting a separate investigation against Rabbi Pinto himself. That investigation revealed that Rabbi Pinto allegedly tried to bribe several other officers for information about the case against Hazon Yeshaya. The charity, which was supposed to have provided millions of dollars to Holocaust survivors and ran a popular soup kitchen and volunteer network in Jerusalem, closed in 2012 under allegations of fraud. Associates of Rabbi Pinto claim that Arbiv, the former commander of the police's Lahav 433 investigative unit, received various benefits, including help receiving a visa to the United States for his son and wife. Additionally, the confederates of the rabbi say they gave $2,000 to Arbiv's son every month, as well as a 700,000 shekel ($190,000) discount for the senior police officer to buy a home in an exclusive section of northern Tel Aviv. The associates added that the rabbi and his aides also helped Arbiv when he served as a representative of the Israeli Police in the US.